I like pork dishes and so does wifey. We’ve been trying out a few places specializing in pork dishes, especially the pork burgers. Since I’m celebrating wifey’s birthday, what is better than going for something that she likes, hence The Pork Place. 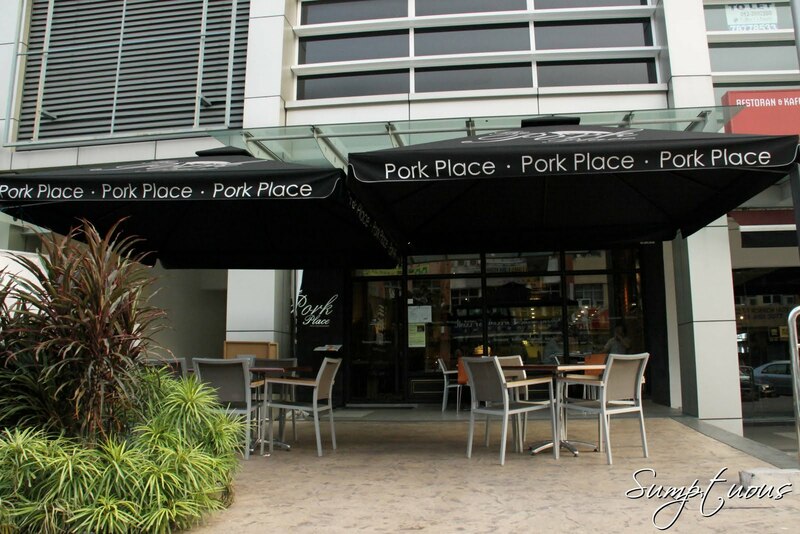 Located at IOI Boulevard Puchong, this place was pretty easy to find and parking was no hassle too. Outdoor dining for the convenience of smokers, but guess most would give their lungs a breather due to the heat during daytime and the level of humidity in this country! Besides serving pork delicacies, The Pork Place also has an enclosed butchery within the restaurant selling their famous Sanbanto pork which is purportedly anti-biotic free and is maintained between 0-4 degrees for its freshness. A view from the upper section where diners can choose to enjoy their meal with more privacy while enjoying the happenings on the ground floor area. The bar at the back section and also where the wine cabinet is located. A fair number of nice wines are available for selection. A view of the upper deck dining area. 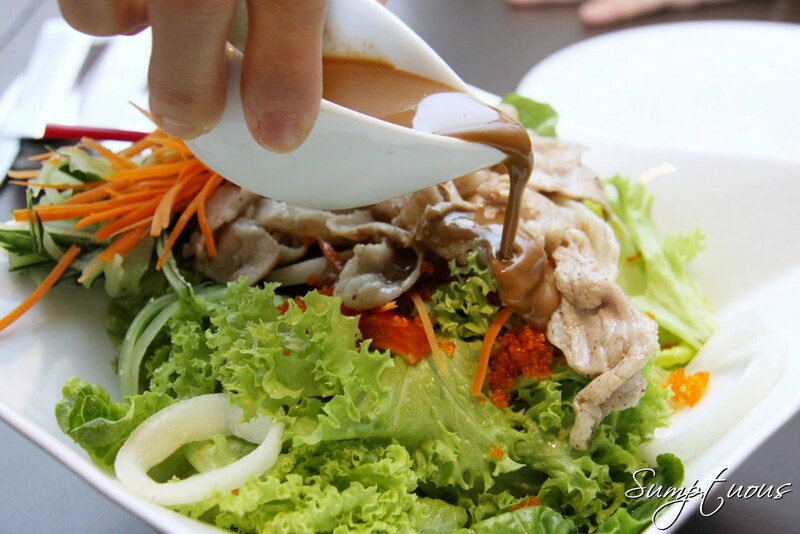 Sliced Belly Salad @ RM 18.00 ~ Refreshing salad with sliced pork belly & Vinaigrette Sauce. Liked it! A 10/10! Salad with pork belly slices is not a usual combo but the creativeness of the chef with using the mixture of vinaigrette sauce (oil & vinegar) made it rather interesting! 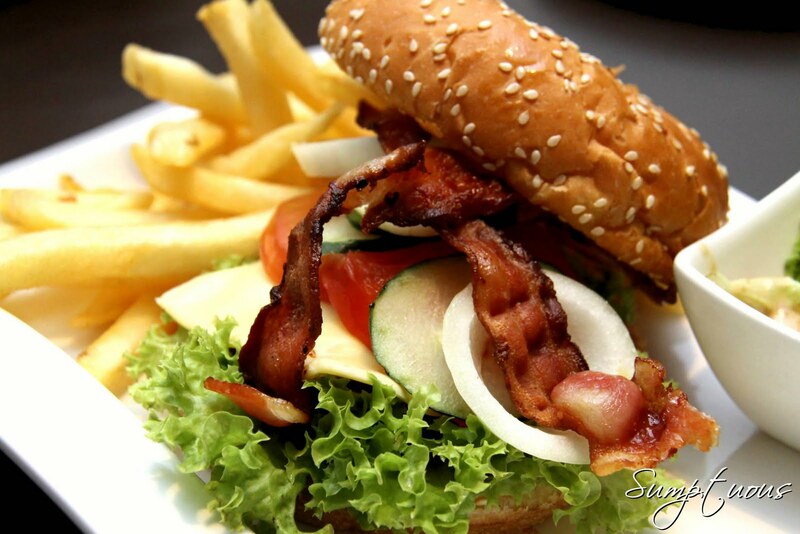 Bacon & Cheese Burger @ RM 19.00 ~ Mouth watering home made pork patty served with fries, green salad and fried bacon. A 7/10! Thick pork patty but not flavorful enough. Bacon was crispy but have definitely tried much better ones at Sri Manja! Dipping sauces for accompanied my fries. Pumpkin Soup @ RM 11.00 ~ Freshly blended pumpkin boiled in pork stock. Tasty but slightly on the sweet side. A 6/10! Spaghetti Bolognaise @ RM 18.00 ~ Grounded pork cooked in tomato sauce, garlic & sprinkled with crispy treasures. Nicely presented but the presence of porky smell was overly pungent. T did not finish it due to the smell. A 2/10! Terriyaki Belly @ RM 29.00 ~ Pan-fried pork belly in terriyaki sauce served with fragrant garlic rice. Ordered this for mom and she enjoyed every bite of it. I taxed a bit and found it irresistible! Will definitely come back for it! A 10/10! Braised Pork Leg @ RM 25.00 ~ Served with fragrant garlic rice and vegetables. Full of collagen but it’s spicy! Meat is tender with nice touch of gravy. Not for kids but it’s certainly worth a thought! An 8/10! This birthday meal for wifey meal came to RM 136.40 inclusive of 5 drinking water @ 0.80 each and a 10% service charge of which I consider to be very reasonable. Meal was pretty good except for the spaghetti. Service was commendable and the ambience is good for some catching up with friends. Like I’ve said, I’ll come back for the salad and the terriyaki belly. I might also wanna check out their weekend special which sounds pretty good. They are the.. This entry was posted in pork burger, Puchong, Western. Bookmark the permalink.